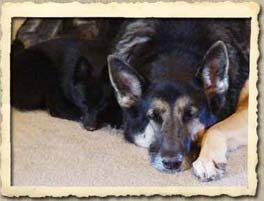 Jewelie and Nikkie curled up and napping after a hard day on the farm. Alarms are set and ready to go off at the first sign of anything suspicious. 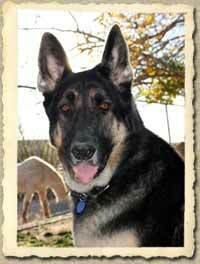 Nikki (2003-2014) is a 106 lb. 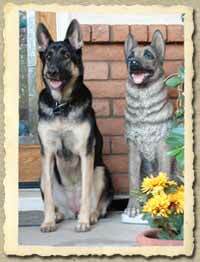 German Shepherd and a retired farm dog. She would guard the chickens and sheep. 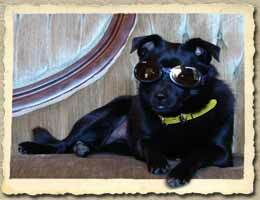 She still chases the hawks and owls from the chickens and she used to chase coyotes as well, or warns us of javalina. Nikki has even chased bobcat off the property. I am sure she would still do that if we let her. 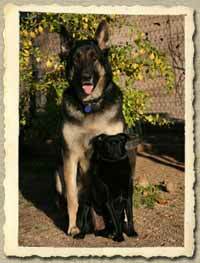 With age and cysts on her feet, we give Nikki smaller jobs that she can still handle. She loves when the chickens are out so she can lay in the pasture with them surrounding her. Nikki must like the smell of our Shetland sheep 'Cupcake' because she likes to sniff Cupcake when she comes by her. Nikki still likes to play with the other dogs too but there is nothing like relaxing on a blanket and chewing a delicious bone or squeeky toy. 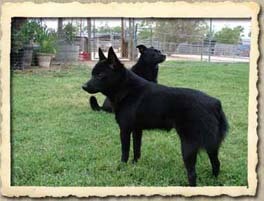 Jewelie (2012) is a Schipperke. She is the Devil Fox of the farm always into everyone else's business. Jewelie keeps her nose to the ground inspecting everything and gets right in the middle of the sheep and chickens. She is a little intimidated by the bunnies but will try to take on any large dog that passes by the farm! 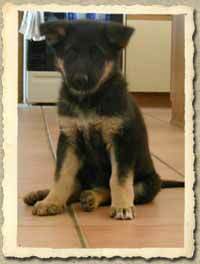 We call her the 'Sheriff' because she will correct any wrong doings of any of the other dogs. In her mind the rules, however, do not apply to Jewelie. If there is anything out of place or looks strange, Jewelie will let us know. If you know Jewelie's protective nature and have ever seen the movie 'Lady in the Water' you would agree she is also one of the movie's feared creature the 'scrunt'. Don't be fooled by her boldness though, she is a real bed bug who curls up right against me at night. 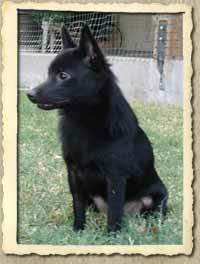 Kia (2009) is a Schipperke mix who is Nikki's sidekick and Jewelie's playmate. Kia came from a small dog rescue that was overcrowded with dogs. 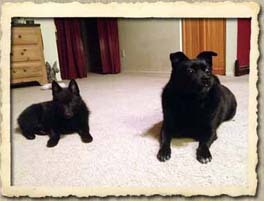 She has all the personality of a Schipperke but her body is a little more rounded than pointy. She is the first alarm that goes off when something is wrong. Her favorite thing to do, besides relax with a human is to ride on the tractor or Kawasaki Mule to take out the manure. She is very respectful of the bunnys and chickens and loves to sit in the lawn/pasture and take a sun bath or go for a ride in the car.